I may be a fashion editor, but I'll be the first one to admit I (sometimes desperately) try to fit in as much tennis coverage as I can. For Who What Wear, I've interviewed both Maria Sharapova and Venus Williams, chronicled Kate Middleton's best Wimbledon outfits, and even snuck in a story about Anna Wintour's love for Roger Federer (because ditto). So when Lacoste invited me on a trip to the Miami Open presented by Itaú this past weekend, I quickly coaxed my editor into letting me go—I think my exact words were "pretty please?" Luckily, it worked. During the trip, the brand took our group of editors and influencers to Turnberry Isle for some tennis drills. Naturally, I spent more time prepping my outfit than I did practicing my forehand—I am still a fashion editor, after all. I may be a few months early, but I decided to go with a Wimbledon-inspired all-white look (save for Lacoste's perfectly lightweight navy bomber jacket). When in doubt, you can never go wrong with tennis whites—they will always feel fresh and classic at the same time. 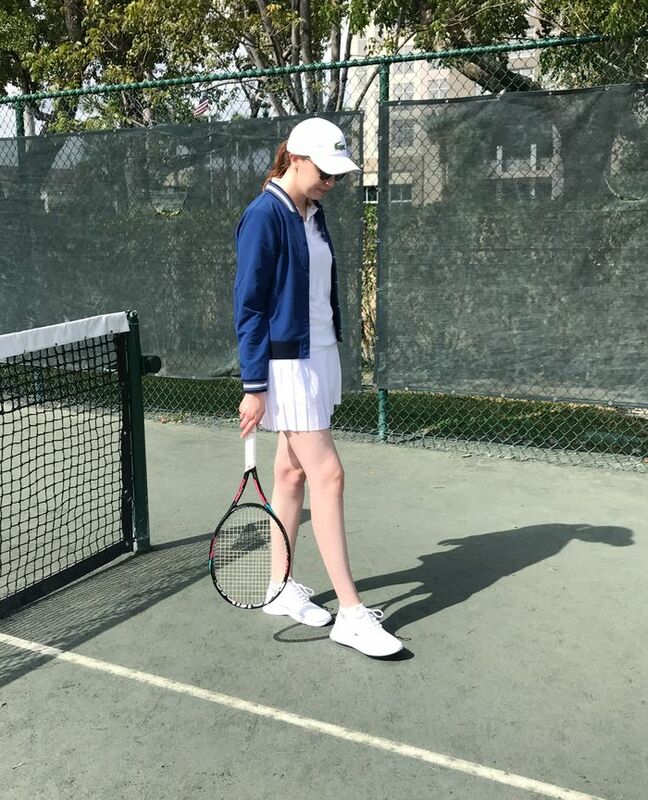 I picked Lacoste's sleeveless polo, pleated skirt, and sneakers, which can all be mixed and matched with any other activewear pieces you own—yes, even your trusty black leggings. Read on to shop the outfit I wore. Ed. note: This press trip was paid for by Lacoste. Editors' opinions are their own.